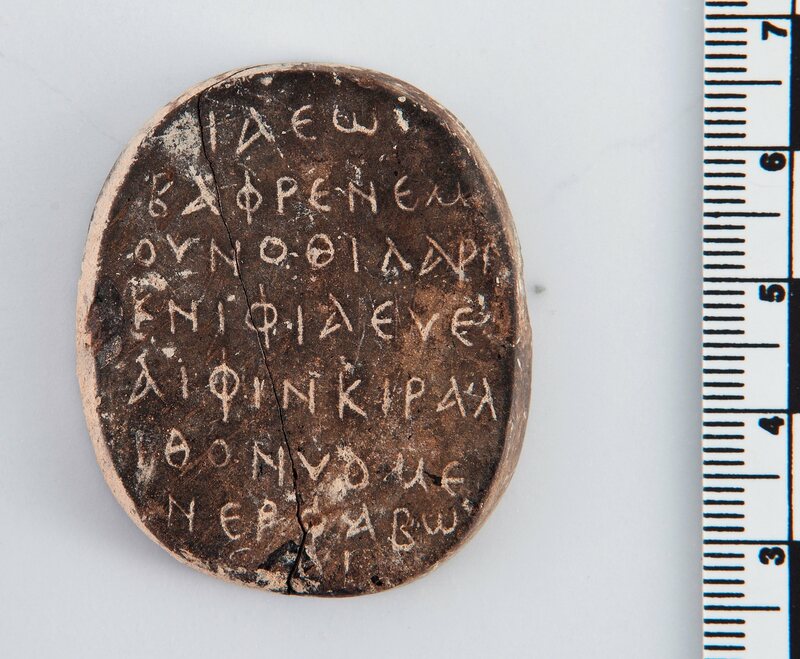 A 1,500-year-old amulet inscribed with a 59-letter Greek phrase that reads the same backwards and forwards has been found in Cyprus. 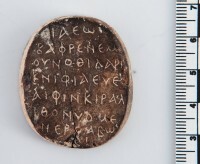 Archaeologists from the Paphos Agora Project discovered it in 2011 during the first season of excavations of the ancient agora of Neo Paphos. Neo Paphos, a harbour city on the southwest coast, was the capital of Cyprus in the late Hellenistic, Roman and Byzantine periods. Renown for its temples to Aphrodite (she made landfall at Paphos after her birth from the sea), Neo Paphos also had an early connection to Christianity. It features in the Acts of the Apostles 13:6-13 wherein Paul curses a false prophet with a year of blindness for trying to lead the Roman proconsul Lucius Sergius Paullus astray. Amazed by the power of God working through Paul, Lucius Sergius converts to Christianity. After the death of Theodosius I, the last emperor to rule both the East and West halves of the Roman Empire, in 395 A.D., Cyprus became part of the Eastern Empire, and although the traditional Greek polytheistic religion was actively suppressed by the authorities, a strong culture of Hellenistic Christianity developed. The amulet is evidence of how long polytheistic beliefs survived on Cyprus and how Christianity was integrated into traditional religious practices, a religious syncretism that would endure for centuries after Theodosius made Christianity the state religion. It 1.4 inches wide by 1.6 inches long and is made of mud clay. 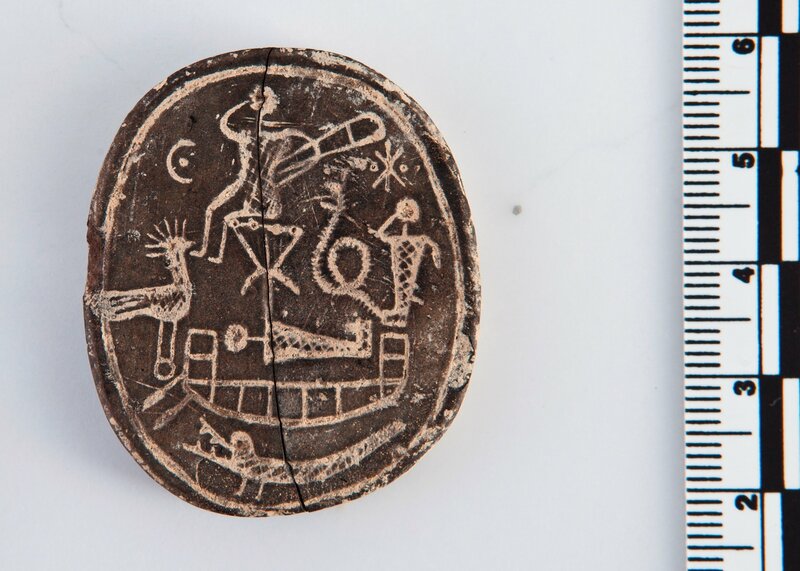 One side of the amulet is crudely engraved with images of Egyptian deities. At the bottom is a crocodile with open jaws. Above him is a mummy wrapped in bandages (probably meant to be the god Osiris) lying on a boat. To the left of the mummy is a bird (its comb suggests it may be a rooster), to the right is a snake and what archaeologists have identified as a dog-headed figure or cynocephalus even though the head is just a rudimentary circle. Above the mummy is a depiction of Harpocrates, a Hellenized version of the Egyptian child god Horus, deity of silence and secrecy, sitting on a cross-frame stool and holding a large scepter in his left hand. He is recognizable because of the characteristic position of his right hand raised to his mouth, a depiction of the hieroglyphic for “child” which the Greeks misunderstood as a “shh” gesture. Horus the Child/Harpocrates was often depicted with a dog, which is how, I believe, the archaeologists identified the cynocephalus as such, but there are incongruities with the design that suggest the carver was confused about the religious iconography. “It must be stated that the depiction is fairly unskilled and schematic. It is iconographically based on Egyptian sources, but these sources were not fully understood by the creator of the amulet,” adoration,” [Joachim Śliwa, a professor at the Institute of Archaeology at Jagiellonian University in Kraków, Poland,] wrote in the journal [Studies in Ancient Art and Civilization] article. Even stranger is the fact that Harpocrates and the cynocephalus have crisscrossing lines on their bodies, which suggest the ancient artist thought these figures should be mummified along with Osiris. While the cynocephalus can be shown with mummy bandages, Harpocrates is not supposed to have them. Mummy bandages have “no justification in the case of Harpocrates,” Śliwa wrote. It makes sense that after more than a century of official Christianity, with all the temples, schools, libraries, etc. where one might learn the standard polytheism destroyed or redirected towards Christianity, people exploring traditional religious imagery and language would wind up with jumbled details. This entry was posted on Thursday, January 1st, 2015 at 11:54 PM	and is filed under Ancient. You can follow any responses to this entry through the RSS 2.0 feed. You can skip to the end and leave a response. Pinging is currently not allowed. “the traditional Greek polytheistic religion was actively suppressed by the authorities”: yes, let us not forget the pagan martyrs. By the by, this morning’s Telegraph has news of the discovery of yet another hoard, this time Anglo-Saxon coins in Bucks. Harpocrates Marx is also a deity of silence. what is the explanation for Iahweh? I don’t recognize that as a name for an Egyptian deity; rather I read that first as Yahweh, the Judaic God. Or is this assumed to be a name of an individual and not a deity? I suspect some kind of joke here: There is possibly not a single greek word in the palindrome, nor did I see a ‘doghead/kynocephalus’. However, I could pick up some ‘Egyptian’. Check out the Gardiner’s Sign List. The ‘Doghead’ (that does not seem to have a doghead at all) might be in fact Duamutef, who was one of the ‘Four Sons of Horus’. First, he was represented as a human wrapped in mummy bandages (later, shown with the head of a jackal). The juvenile Horus, a.k.a ‘Harpocrates’ is himself a son of Isis. Alternatively, The ‘star’ could be in fact ‘I’esos+’X’ristos, son of Isis/Mary, and the ‘bread’ that Horus is holding in his arm a ‘surfboard’. ‘Raising the right paw to lips’ as a gesture -usually a can is playing an important role- is btw still witnessed at the rocky beach near the -according to the map remarkably massive- north east gate of ancient Paphos (i.e. the one near the lighthouse). Could the massive ‘rocks’ be the remains of a former 2nd harbour that Neo / Kato Paphos might have had ? What is the language of the inscription? It uses the greek alphabet but it makes no sense in Greek at all. Sliwa wrote this up for the academic journal Studies in Ancient Art and Civilization back in 2013. I expect he explains what language it was there. Curious that the popular press dropped that part. Or perhaps not so curious. Could it be like the translation of the Amazons’ names on Greek vases, recently interpreted to be barbarian words written phonetically using the Greek Alphabet but making no sense in the Greek language? Maybe when this inscription is spoken it actually says something completely different in another language, thereby making it even more of a code. According to the Venus Tablet of Ammisaduqa, Venus was much brighter and was also given the name of Ishtar, a war goddess because of it’s fiery tail: … Venus. I think that This is telling the story about the stars before they became planets. Juniper was seen as an alligator with sometimes a bird on it’s feet… Mars as a man smoking a cigar ( in mesoamerica, so reverse it) and snake at his feet (reversed again) This is about the sky before it’s most important star, Venus, became a planet… I could be wrong. We sometimes forget that the planets were not all the way they are now. what do you guys think? “Venus, without a magnetic field, would not likely have produced the tri-lobed plumed headdress shape, but only the tail of its surrounding coma, directed away from the Sun, plus a tail of sputtered particles which would split into two parts. This is seen in comets today (which also do not have a magnetic field). Additionally there might have been long wisps of plasma from its polar regions. These would seem to be coherent plasma streams, bent to the direction of the Sun, but not organized into tri-lobed plumes.